Could Kaplan Shake Up District Four Race? It was no big surprise Wednesday when Rebecca Kaplan, Oakland’s At-large Council member, said she was officially running for mayor. She’s been more than hinting that she wants the city’s top job since early spring. The Bay Citizen, the new online news partnership between UC Berkeley and The New York Times, concerned itself chiefly with the lesbian angle. If she wins, Kaplan would be the only openly gay mayor in the Bay Area. Oakland would be the third largest city in the country, after Houston and Portland, to have an out mayor. 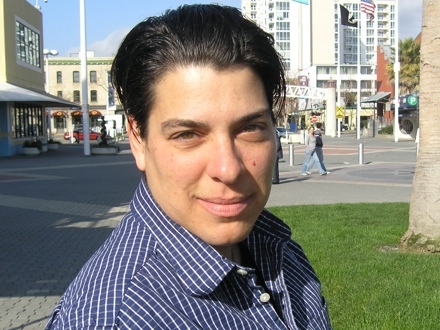 The Bay Citizen noted that Oakland has one of the largest lesbian populations in the nation. Kaplan has another advantage. She’s already won a citywide election, 84,000 Oaklanders have already cast a vote for her. Look at this map of the precincts that backed her when she ran for City Council just two years ago. 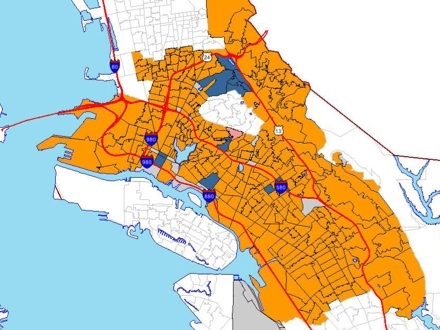 Kaplan’s precincts are orange. Kerry Hamill’s are blue. The question for voters in Montclair is what will this mean for the District Four race. Is it possible that Jean Quan could decide that a split progressive vote would be no match for Perata, and opt to run as the incumbent in District Four for a third term? If that happened, would any of the contenders vying for her seat have a prayer? Quan has until August 6 to change her mind. Update: As she said in a comment below, Jean Quan says she has absolutely no intention of leaving the mayor’s race. Richard Cowan, her chief of staff, said the same thing in a phone conversation this morning. Should be interesting. Time for Quan to move on. Jean Quan has bided her time long enough. That ego can not be restrained by the boundaries of district 4 any longer. First she bankrupt the school district, then the city and now she must finish it off by fulfilling the Dellums agenda of breaking the city beyond repair! Well she does have 1 thing going for her- she didn’t get us into this mess. Perata & Quan have been at the helm of bad public policy for far too long, and now those chickens are coming home ot roost. I mean failure in backing public employee unions, their bloated pay and benefits that are outstripping citizens ability to pay. These have been horrendous contracts. Now I don’t believe that Kaplan can or will do anything about public service employee unions, she’s as left as they come so unless a budget hawk (and I wouldn’t mind one with a liberal heart but do they exist?) enters the race we’re pretty much screwed. Again. BTW did you know that Oakland’s sewer rates are going up, we pay the highest taxes, bond money is misused and for what??? My friends have been ringing my phone about this for the last half hour. I understand that a new person is now writing this blog…and Adam may or may not be a supporter of Rebecca. I don’t know. All I know is that he talked with one of my staff members who told him categorically that I am not dropping out of the race. I have been home all day working. Could have called me. I don’t appreciate what looks like an attempt to break my momentum. I have held about 130 house meetings, recruited about 600 volunteers, and have walked many dozens of precincts. I have endured a week of tough attacks and we have answered every call and email. I regret having to give up my seat here, I have served this community for nearly 20 years out of love for Oakland and my neighbors. My phone has been off the hook about this posting. I understand that Debbie Richmond has moved and that this blog is now being written by the Oak Book owner, Alex Gronke. Who may or may not be supporting Rebecca. I don’t know. I do know that when he called one of my staff members we categorically denied that I was reconsidering. He could have called me. This is a disappointing entry which seems to be aimed at slowing down my momentum. In the last months I have held 130 house meetings, gathered nearly 600 volunteers, and walked many dozens of precincts. I have withstood a week and small fortune of political attacks. It’s made me more committed to the race and to Oakland. Giving up my council seat is not a decision I took lightly. I have love and have worked hard for this community for nearly 20 years. I hope this blog is not going to be another political battleground. We regret that anyone thought we were choosing sides in this race, or trying to dampen Ms. Quan’s momentum. Debby Richman built this blog into a community resource over the course of two years by being relentlessly fair and accurate in posts that ranged from the lighthearted to the profoundly serious. We, the editors and writers of OakBook, fully intend to continue Debby’s commitment to fairness and accuracy. We agree with Ms. Quan that a political battleground where people and ideas are not given a fair hearing is the last thing District Four needs. We will work hard to make sure it remains the valuable forum Debby built with her intelligence and hard work. It would seem the more logical conclusion is that Rebecca Kaplan’s entry into the Mayoral Contest would shake up the at-large seat more than the District 4 race. But more important, her entry further enlivens an already lively mayoral contest. Jean Quan certainly knew that she had to give up her district 4 seat in order to run. At no time did Jean Quan predicate her running for mayor on who her opponents were or might be. Her decision was based on the conviction she has a deep understanding of the issues facing this city (and, I might add, those same issues daunt many other municipalities nation-wide) how we came to this place and, more importantly, where we have to be if we are to become a vibrant and attractive place to live and work. The citizens of Oakland will make their choice based on candidates records and vision for the city. I think this is more important to the citizens of Oakland than slicing and dicing the electorate based on sexual preference or other labels. Speculating without getting comments or even a preponderance of evidence seems kind of silly. If it’s political intrigue that is grabbing at you, then at least first build up the case. I’ll give you an example: Jean comments here about withstanding a week of political attacks. This undoubtedly refers to the robocalls and printed flyers attacking her for calling for firing 200 OPD Officers. Which she never did. Ignacio did. Now these flyers have been linked to supporters of the Don. & it takes time to organize the production and printing of them, about 4-5 weeks without backlogs. (IF a print shop has other business, then maybe longer). Yet Ignacio’s call to fire 200 officers started only about 2 weeks before the robo calls and flyers. This timeline (if even close to accurate) has to make one wonder: Was this a set-up? There is something really unseemly about someone who wants to be Mayor of a big city whining in the comments section of a blog. The blog author raised interesting questions. It is legitimate to wonder if Quan may drop out. There is little enthusiasm, it seems, for her candidacy. It’s not even clear she can win her own district in a Mayor’s race. It doesn’t appear she’s very popular. So, given all of that and that her campaign looks stalled, wondering if it might end soon is a valid question. Coming here and moaning that she’s been treated unfairly makes Quan look like she isn’t ready for the big stage.